PULP OBSCURA DEBUTS FIRST FULL LENGTH DIGEST NOVEL-THE NEW ADVENTURES OF IM ANTHONY, SUPER-DETECTIVE! In 2012, Pro Se Productions, an independent publisher of Genre Fiction and New Pulp, launched an exciting new imprint in conjunction with Altus Press, the leading publisher in reprinting Classic Pulp Fiction. PULP OBSCURA focused on producing new stories featuring classic characters from Pulp’s Golden Age, often overlooked and forgotten since they were originally published. The eighth PULP OBSCURA title debuts this week and it is a milestone for the imprint, usually known for its anthologies. This latest release is the line’s first full-length digest novel. 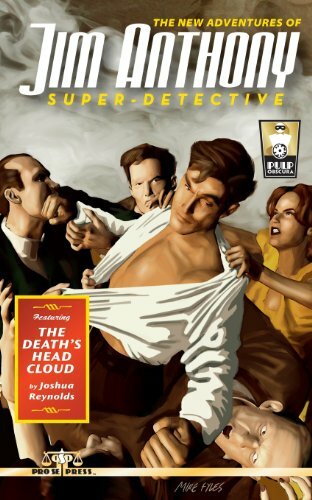 THE NEW ADVENTURES OF JIM ANTHONY, SUPER-DETECTIVE: THE DEATH'S HEAD CLOUD by noted Author Joshua Reynolds introduces the latest new tale featuring one of Pulp’s most unique obscure characters! Originally written by such greats as Robert Leslie Bellem, W. T. Ballard, and Victor Rousseau Emanuel, Anthony was a 'half Irish, Half Indian, and All-American' Adventurer who inherited great wealth and has amazing mental and physical abilities. Scholar, businessman, scientist, criminologist, inventor-Jim Anthony is prepared to face any danger, solve any mystery and overcome any challenge in his battle for justice! In ‘The Death’s Head Cloud,” a smothering fog of doom heralds a terror that leaves a pile of bloody corpses in a busy subway station! The Death's Head Cloud strikes swiftly, snaring innocents in its foul grip, leaving madness and death in its wake! Will Jim Anthony be able to solve this mystery or will he also succumb to this terrible menace? Joshua Reynolds, known for previous works featuring this classic Pulp Character, breathes new life into Jim Anthony in this PULP OBSCURA release. Reynolds is a professional freelance writer. In addition to his own work, he has written for several tie-in franchises, including Gold Eagle's Executioner line and Black Library's Warhammer Fantasy line. Josh has also written several stories previously for Pro Se Productions as well as writing both Anthony tales and other stories for numerous New Pulp and Genre Fiction publishers. From out of the Past the Super-Detective Returns in a Bold New Adventure As He Fights a Deadly Menace that Lurks in the Very Air We Breathe! Featuring a stunning cover by Mike Fyles, THE NEW ADVENTURES OF JIM ANTHONY, SUPER-DETECTIVE delivers mystery, action, and Pulp with both fists and barrels! From Pro Se Productions and Pulp Obscura! THE NEW ADVENTURES OF JIM ANTHONY, SUPER-DETECTIVE: THE DEATH’S HEAD CLOUD is available now in Print for $9.00 via Amazon at http://tinyurl.com/k55wpan and via Pro Se’s own Createspace store at https://www.createspace.com/4428238. The title is also available as an Ebook for $2.99 for your Kindle at http://tinyurl.com/m5k3orj, on the Nook at http://tinyurl.com/lckxb2m, and for most formats at http://www.smashwords.com/books/view/354430. If interested in review copies or interviewing the Author or the Publisher, contact Pro Se’s Director of Corporate Operations, Morgan Minor, at MorganMinorProSe@yahoo.com. Want to keep up with what Pro Se Productions is doing in New Pulp and Genre Fiction? PRO SE PRESENTS: THE PODCAST- NEW PULP FANTASY MAVEN NANCY HANSEN! PRO SE PRESENTS: THE PODCAST EPISODE 9-A FREE AUDIOBOOK-THREE CARDS WILD!